Gayle Adams | The Retirement Coaches | JBL Financial Services, Inc. Joining us in March 2017, Gayle is our Client Services Assistant and the friendly voice on the phone that greets you and schedules your appointments. She has been in the finance industry for over 16 years including a Broker Dealer office working as a VP over Continuing Education in the Compliance and Licensing Department. 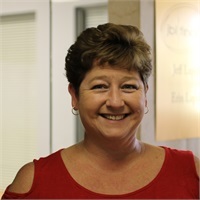 Known throughout her career for constantly striving for improvement, Gayle is adept at streamlining departmental workflow and developing policies and procedures to enhance financial performance and operational productivity. She provides creativity, enthusiasm, and humor to our office. She enjoys camping, fishing, and traveling with her husband and two children.